I suppose that this section is just asking for trouble. Well – Wez G has been diagnosed as a delusion and the court case was lost based on the evidence (MHRT a couple of months back) so I have no real alternative now that my identity has been officially hijacked, than to be other people. So, based on a real story which did hurt a little… My first DoG, for this week will be ‘Che Guevara…. 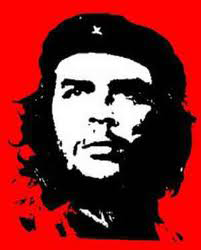 Anyway, full of revolutionary zeal, I believe I’m Che because he was a DJ who was also a revolutionary and I guess that the launch week of End Of Terror has got to me a bit… and I had a Swedish pair of Che socks once too. I dunno – bit grandiose .- I hope my illness can be cured by all the meds this week and that it goes away – but as mental illness is all incurable I’m sure it will return in time for next Saturday’s DoG. This entry was posted in Delusions of Grandeur #DoG and tagged 'Delusions Of Grandeur, #DoG, Mental health, Psychiatry on 8th October 2011 by Wez G.